Finally! My copy came in to my local bookshop. 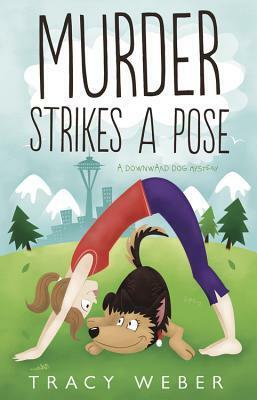 This is the first in a new yoga themed cozy mystery. The series opens with the reader meeting Kate, a yoga studio owner, who has a run-in with a homeless man and his dog Bella. Eventually, they become friends or at least Kate tolerates George and Bella’s presence outside her studio. George is murdered and Kate can’t just let it be written off as a dispute between the homeless, which is what it seems the local police are doing. She investigates with her sometimes side kick, Rene, and Bella, George’s dog. Along the way, she meets Michael, the owner of Pete’s Pets, and a romantic interest. There is a lot of investigation and quite a few leads and suspects. The mystery is very well crafted. The main characters are all developed and realistic. I really appreciated the urban setting, which is very different from the average cozy. This is very reminiscent of the urban setting in Kerry Greenwood’s Corina Chapman series, which I love. Very different characters, themes and settings, but both series have a similar contemporary urban feel. The mystery plot and the yoga theme flow seamlessly together. The theme does not overwhelm the mystery plot or the characters. A fun, well written first in a new mystery series. I’d recommend it to anyone who likes cozies, especially ones with a more contemporary feel. I am definitely going to be looking forward to the next one in this series. This entry was posted in Book Reviews and tagged book review, mystery, yoga. Share book reviews and ratings with Kindle English Mystery Book Club, and even join a book club on Goodreads.